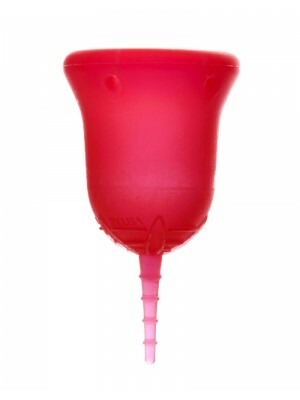 The SckoonCup is an attractive menstrual-cup made of medical-grade silicone. The cup itself is produced using an advanced molding technique that produces a smooth outer curve with no bumps. It has angled suction holes at the top which allows it both to have great suction and to have a high capacity despite their smaller size. The stem is thin and long with ridges to help grip when removing the menstrual cup. It's soft, so it's easy to fold and insert, but it's firm enough to pop open easily once it's inside. It is one of the more expensive cups, but they do have multipacks where you could buy two and share the second with a frugal friend. (It's never a good idea to use the same menstrual cup as someone else). In addition to the SckoonCup, the same company also offers organic, reusable menstrual pads in case a menstrual cup turns out not to be for you. Check out their website for more details.